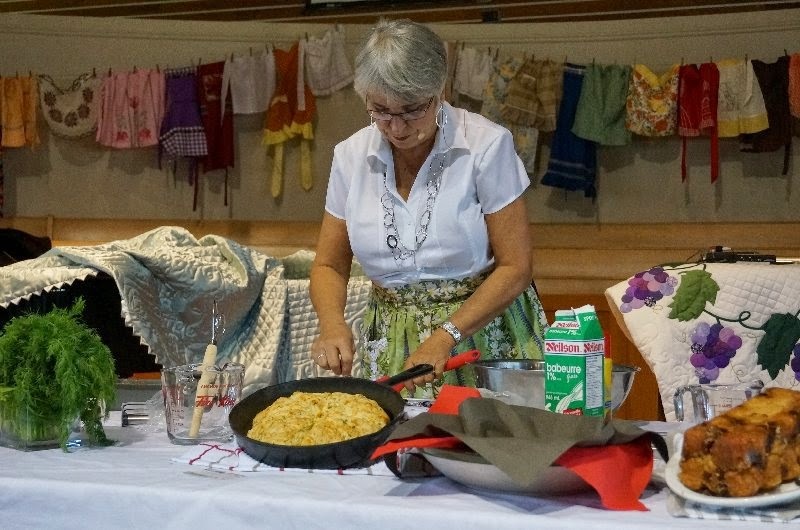 Mennonite Girls Can Cook: Variations on a Biscuit theme. A few weeks ago I was invited to do a presentation on behalf of Mennonite GirlsCan Cook at the Eastern Mennonite Women's Spring Enrichment conference in my home town of St. Catharines Ontario. 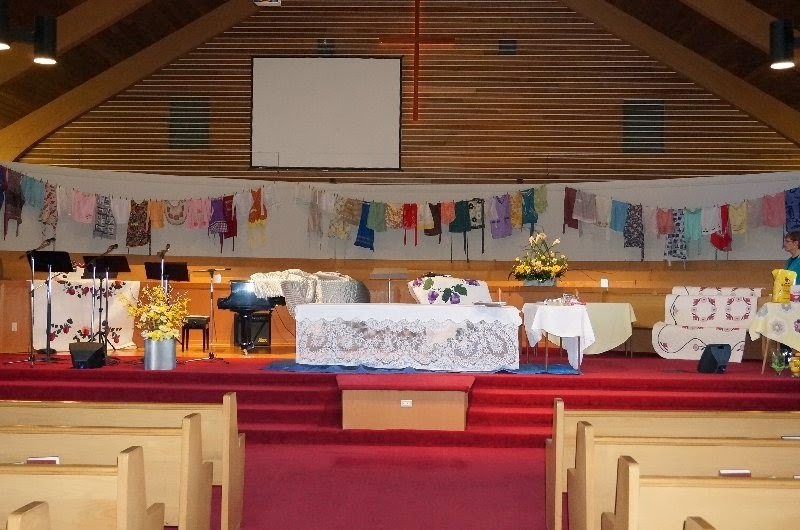 The ladies at the St. Catharines United Mennonite Church did a fabulous job of decorating for their event with aprons and quilts. There must have been over 300 aprons, from modern to vintage, purchased and hand made. It was fun to tour the church and take a close look at many of them. As part of the presentation I did a demonstration on the versatility of Biscuit dough. Some of the following ideas were part of a hand out given to the women at the conference. I thought it would be fun to share it with all of you. would like a fresh baked addition to a meal. The recipes for Judy's Buttermilk Biscuits, or Charlotte's Biscuits Supreme as well as other recipes for biscuits can be found in the MGCC website index under Quick Breads. 1. Always heat your oven before beginning to mix the biscuits. Once they are mixed and formed they should go directly into the oven. The baking powder starts to work the second it is moistened. 2. Place all dry ingredients in the bowl first. 3. Grate the butter or margarine into the flour. (my favourite tip!) Just be sure the butter is very cold. It is much quicker than using a pastry blender. Toss the butter with the flour until it is coated well. 4. You can refrigerate the dry mixture at this point to be mixed with the liquid just before baking. 3. Mix liquid ingredients before adding to flour. 4. Mix together lightly with a fork. 5. Knead only enough to incorporate the flour and liquid. No more than 12 times! 6. Anything made with biscuit dough is always best eaten the same day. You can cover leftovers loosely and serve the next day but they are better fresh. Any of these would make a nice quick appetizer or snack. The savoury biscuits are great served with soup and the sweet ones as a last minute dessert. Roll dough 1/4" thick, Cut into rounds to fit inside muffin tins. Fry 1 lb. hamburger with onions and peppers. Season with salt and pepper. Add 1 small can of corn and enough BBQ sauce to moisten. Fill unbaked biscuit cups with hamburger mixture . Top with grated cheese and bake 10-15 minutes. Roll dough 1/2" thick. Spread with desired filling. Roll up as for cinnamon buns. Slice 1 1/4" thick and lay slices on parchment lined baking sheet. Bake at 400º for 10-15 minutes or until golden. Basil Cheese Biscuits Spread with mayonnaise and sprinkle with approximately 1 teaspoon dried basil or chopped fresh basil. Season if desired with garlic powder or seasoned pepper. Top with 1 cup shredded cheese (cheddar or parmesan or combination), roll up and slice. Or you can follow a more detailed recipe for Basil Cheese Biscuits on our blog. Spread dough with thick salsa instead of mayonnaise. Sprinkle with Cheddar cheese, roll up, slice and bake. Mix chopped ham or a can of salmon with a bit of mayonnaise, chopped celery and 1/ 2 cup shredded cheese. Spread over dough and roll up. Roll up, slice and bake. Serve with a cheese sauce or cream gravy. Spread with softened butter, sprinkle with a combination of 1/2 brown sugar and 1/2 white sugar (about 3/4 - 1 cup altogether) and cinnamon. Roll up, slice and bake. Drizzle with a thin icing sugar glaze while still warm. Check out Kathy's recipe in the Celebrations Cookbook. Be creative - try bacon tomato and cheese, ranch dressing and chopped vegetables or anything else you can think of. Monkey Bread These are on the table in the picture above - I'm sorry I didn't get a picture of them. Using 1 or 2 recipes of biscuit dough, divide each recipe into 16 small portions. Roll into balls. Mix 1/2 cup sugar and 1 tsp. cinnamon in a plastic bag. Placing a few balls in the bag at a time, shake until coated in sugar and cinnamon. Sprinkle raisins and/or pecans in between layers if desired. Melt 2/3 cup butter and mix with 1 cup brown sugar. Pour over biscuit balls in pan and bake for 20-25 minutes or until browned and bubbly. Cool in pan. Invert on to a plate and serve. Apple Pockets: Lay a peeled, cored and quartered apple slice in across the centre of a 4"square of rolled out biscuit dough, sprinkle with sugar and cinnamon and pull two corners towards the centre over the apple slice. Bake at 400º for 10 - 15 minutes. Drizzle with icing sugar glaze. Smokie Crescent Rolls: Roll biscuit dough into a circle, cut into 8 wedges. Place a smokie or piece of pepperoni and a small piece of cheese (if desired) on the wide end and roll up. Bake for 10-15 minutes at 400º. Add the following ingredients to the dry biscuit mix before adding the liquid. Mix lightly with a fork, knead lightly 10-12 times and cut biscuits into desired shapes. Bake as directed. 1. Crumbled farmer sausage and shredded cheese. 2. Chopped ham and shredded cheese. 3. Shredded cheese, finely chopped sautéed onion and fresh herbs. 2. Creamed salmon and peas. Add a can of drained salmon, and frozen peas to a basic cream sauce. You can flavour it up with sautéed onion and celery if you like. 4. Shortcake with any other kind of fresh fruit - Blueberries, peaches, raspberries etc. Melt butter and brown sugar and spoon a tablespoon in the bottom of each muffin cup. Top with chopped pecans, raisins, drained crushed pineapple or rhubarb. Cut biscuit dough into rounds and place over brown sugar mixture. Bake as directed and turn pan upside down on to a baking sheet after baking. The variations are limited only by your imagination. Try a batch for dinner tonight and let us know what you did with this versatile dough! what a great recipe to have on hand, on the variations are wonderful, thanks for sharing!!! Thanks for the tips for making biscuits. Never thought of grating the butter--what a "grate" idea (pardon the pun)!